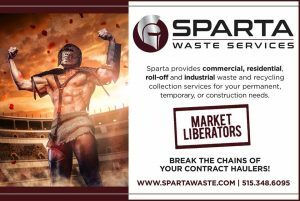 Sparta Waste Services > Sparta Community > Uncategorized > We are the Market Liberators! We are the Market Liberators! What is a market liberator? This concept was first conceived by Sparta Waste Services CEO Anthony Colosimo in the early 2000’s. “When businesses vie for any service, they want to have options, options that benefit them in service and prices. This free flow of options increases business and product quality. When the market becomes stagnant, such as monopolies and duopolies, this doesn’t give the customer options and forces them into services they don’t need, prices that don’t fluctuate and locks them in to strict contracts. The metro market as it exists currently has become stagnant. Every company wants to stay in their box, and charge the same and offer the same services, they’ve become lookalikes. What you need is a renegade, a company to change the paradigm of the market, and to come in and liberate the market. A company that offers services and pricing that do not exist in a stagnant market; a market leader. Without this, businesses and cities truly have no option for a free-flowing consumer based market. That’s what I’ve always done, and that’s what I’m continuing to do with Sparta.